Knowledge management is a series of activities used to sublimate information and knowledge in an organizational knowledge system and effectively utilize this knowledge for organizational management. 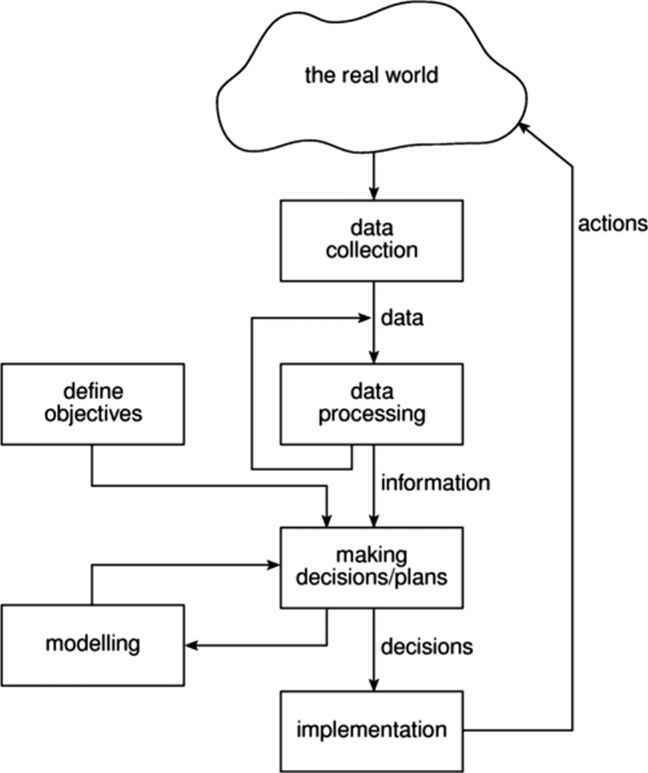 This series of activities includes such processes as specification of information and knowledge, collection, adaptation, systematization, application, distribution and creation. 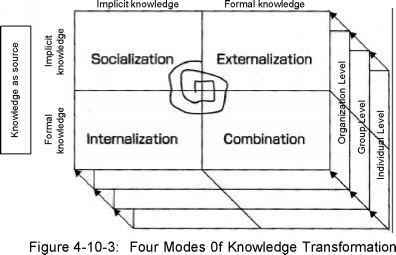 Professor Nonaka, using four modes of knowledge transformation as shown in Figure 4-10-3, explains the process of creating knowledge in an organization through interaction between implicit knowledge (subjective knowledge, experienced knowledge, simultaneous knowledge, and analog knowledge), and formal knowledge (objective knowledge, rational knowledge, orderly knowledge, and digital knowledge). The knowledge belonging to individuals is reused and utilized on a personal level but often is not shared. On the other hand, the knowledge held by an organization cannot be effectively utilized by individuals unless it is easily accessible for them. Therefore, knowledge management involves two aspects: the process of formalizing and sharing implicit knowledge held by individuals and the proces s of establishing a system to share knowledge organizationally and effectively. Also, it is necessary to consider incentives such as compensation for individuals who provide information in addition to reforming the corporate climate in order to facilitate information sharing. Knowledge management has been adopted by various organizations in recent years, and it is beginning to play an important role as part of efforts to create value. As organizational management and business activities are shifting towards projects, knowledge management is becoming increasingly significant.